On the Seto Inland Sea, looking out over the Sanuki mountain range, sits the island of Shikoku and the old castle town of Takamatsu, Japan. Now a vibrant city, Takamatsu has been an economic hub of the region since the Edo period. 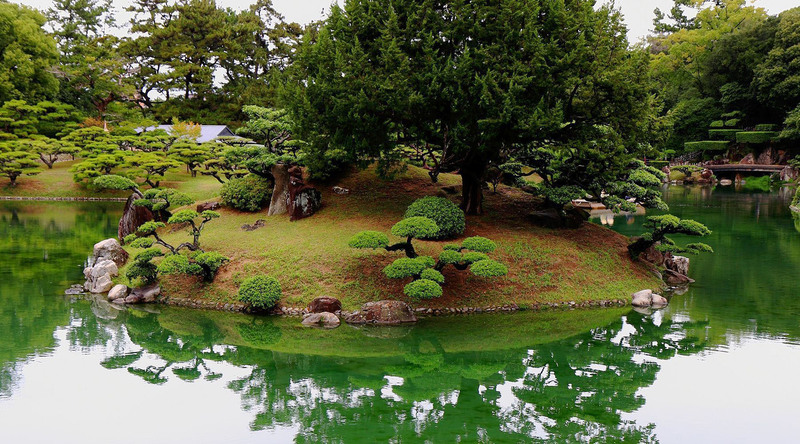 To get a sense of its history, visit Tamamo-koen Park. The 16th century Takamatsu Castle had been destroyed, but there’s still plenty to explore: ruins, water moats, and classic Japanese-style yagura or turrets. At beautiful Ritsurin-kōen, stroll through hills, bridges, islands and ponds, or sip matcha (powdered green tea) at a thatched-roof teahouse. Venture to Yashima, a 293-meter high plateau, for the best views of the sea and a visit to the Shingon temple Yashima-ji. Enjoy the city’s shopping, new waterfront and many restaurants, where you can sample fresh seafood or Sanuki udon, a famous noodle dish. Stroll among the flowers and trees of Ritsurin Garden, a botanical paradise dating to the 1600s, before discovering the beauty and history of Yashimaji Temple. Journey to the Nakano Udon School and take a noodle-making workshop, followed by a visit to the Konpira Shrine, one of the most popular shrines in Japan. Enjoy a panoramic drive through Takamatsu on your way to discovering the sacred Zentsuiji Temple and one of the few feudal castles remaining in Japan.